These six items are at the top of my list of favorite comfort foods, and those meals are some of my favorite memories from college. After we started dating, they quickly became some of Brian's favorites as well. I already mentioned that my hubby was craving some good ol' stick-to-your-ribs comfort food, and this was exactly the kind of meal he wanted. 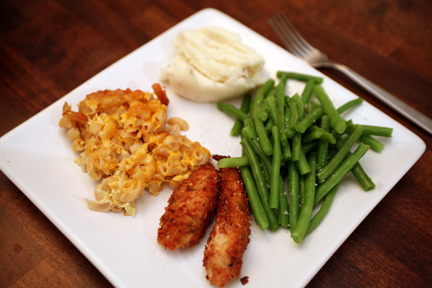 So, tonight we cooked together and made chicken tenders, mac + cheese, garlic + dill mashed potatoes and steamed green beans (I had to have SOMETHING healthy!). It was a wonderful, filling meal, and I didn't even try to over-"healthify" anything (hubby may have divorced me...not really!). I did load my plate with steamed green beans and took smaller-than-normal helpings of the other, not-so-healthy options though. The one thing I changed in my mom's amazing mac + cheese recipe was that I used brown rice pasta instead of semolina...I LOVE this stuff! Its texture is so similar to semolina, I don't even notice a difference. I loved the meal, and I loved cooking with Brian, and I love that this kind of food brings back such great memories of friends and family, but I don't love the guilty, nagging voice I have in my head that is telling me I should have tried to make a healthier dinner. :( Why does classic comfort food always involve frying, cheese and potatoes? Now, I'm not saying that my healthy meals don't evoke satisfying feelings, because they do, its just a different kind of satisfaction. 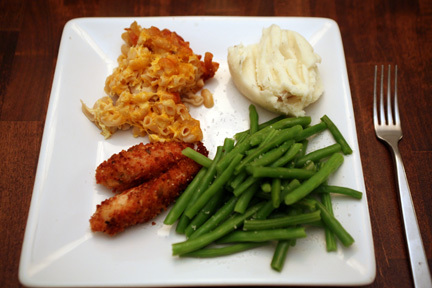 Think how heightened my enjoyment of the meal would have been if I had made healthy chicken fingers, mac + cheese and mashed potatoes that still tasted just as good as the originals?!?! So I'm setting a new challenge for myself and my hubby. 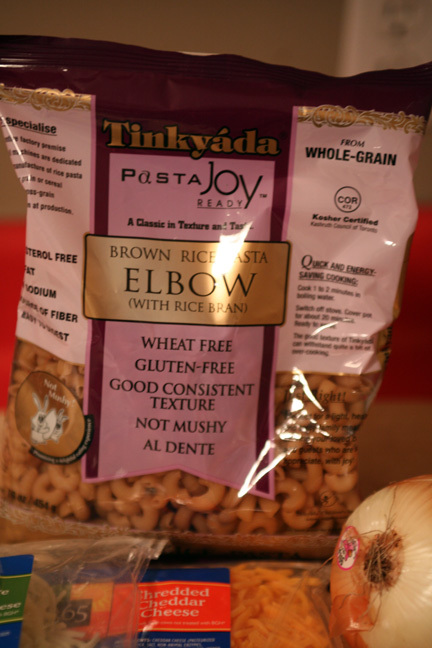 One night a week we are going to pick a classic comfort food from mine or Brian's past and "healthify" it. And we're going to do it together, because part of what was so great about tonight (and last night's home made pizza) was being in the kitchen cooking side-by-side.